Below are some of my favourite beauty looks from the 2015 Oscars. You can easily re-create the looks at home with my tips and product recommendations. One of my favourite beauty looks for every day is the “no make up” trend. It has been all over the NYFW runways, so it was no surprise that many starlets, including Jennifer Aniston, Reese Witherspoon, and Jennifer Lopez, opted for the trend. Jennifer Aniston, Reese Witherspoon, and Jennifer Lopez let their natural beauty shine through with a natural make up look. For evenings, I love bold lips and sultry eyes. This look is a classic for the Red Carpet and a definite nod to Old Hollywood. 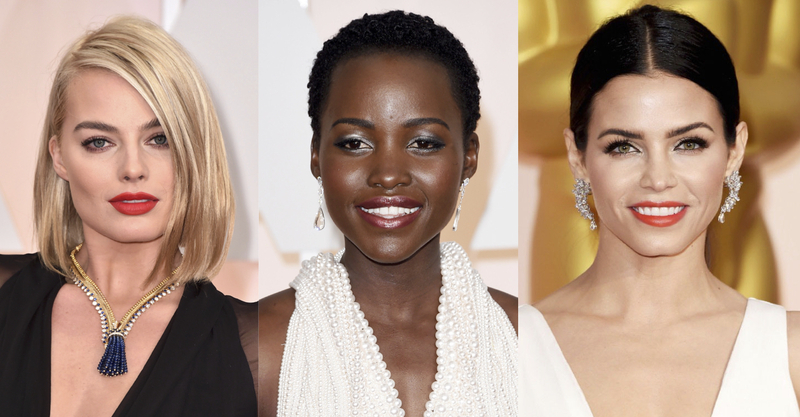 Margot Robbie, Lupita Nyong’o, and Jena Dewan all looked confident and beautiful with their statement make up. Margot Robbie, Lupita Nyong’o, and Jena Dewan exuded confidence and glamour with their sultry eyes and bold lips. Every look you see on the red carpet has one thing in common: a foundation of healthy, glowing skin. When prepping your skin for a flawless face, what you put into your body is just as important as what you put on. A healthy lifestyle that includes daily exercise (sweating out the toxins! ), SPF, and proper nutrition is the best place to start. Having suffered from acne as a teenager and still having my occasional struggles, I now have the healthiest skin I have ever had in my life. I start each morning by drinking a glass of warm water and lemon juice. Among its many benefits, lemon water helps to cleanse your system of toxins, and maintain skin’s radiance with its antioxidant benefits. Start your day with lemon water, and then eat your greens (if you prefer, have them as a juice or shake) half an hour after drinking your lemon water. Your body will be prepped for digesting and metabolizing all the healthy vitamins they have to offer. Make sure you are getting all the necessary vitamins. Vitamin E helps maintain healthy skin, eyes and immune system. I always make sure to take my Vitamin E supplement with my Vitamin D (to promote a healthy immune system, bones and teeth). Unless you live in a sunny climate, chances are you are not getting enough Vitamin D from moderate sun exposure. Vitamin supplements are the second best way of making sure you are getting all your necessary daily vitamins. It is always best to consume the natural vitamin source by enjoying a balanced and colourful diet. The more colour, the more natural vitamins. Kale, spinach, broccoli, beets, red bell peppers, nuts and lean proteins are staples to my daily diet and include a wide range of necessary vitamins. Please note, the above diet and supplement regimen has helped my skin, but may not be for everyone. Please consult a physician prior to taking supplements or making dietary changes. Staying hydrated is incredibly important to maintain a healthy body, immune system, and flushing out toxins (toxins that can inevitably cause acne). Wherever you are, no matter what time of day, you should always be drinking water. While you should be drinking your 2 Litres throughout the day, I start each morning with 1 L, including my lemon water, so I do not forget. It is easier to drink 1 L than you might think, especially if you prepare a full teapot for personal consumption. Coconut water can also substitute some of your water intake for the day. Now that you have thoroughly cleansed and purified your body, your skin is surely looking radiant. To create the perfect canvas for your make up, wash your face with a gentle cleanser (or if you have very dry skin, plain water). Pat your face dry with a soft towel making sure not to scrub. You do not want to irritate your skin or spread oils if acne is a concern. Once skin is cleansed, it is time to moisturize. I start by lightly patting an eye cream onto the eye lid, around the orbital bone, and under the eye. Use your fourth finger to apply in soft taps so you do not pull the gentle skin around the eye. Next apply your moisturizer and SPF in that order. If using multiple moisturizers, apply them from lightest, to richest formulas. My preferred moisturizer is Josie Maran 100% Pure Argan Oil Light, followed by an oil-free SPF. If you are going out at night, skip the SPF so you do not feel the product build-up. 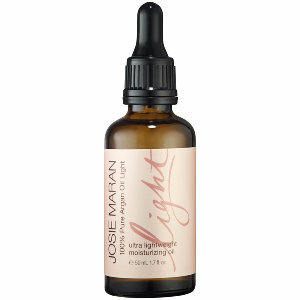 Josie Maran 100% Pure Argan Oil Light, available at Sephora. To perfect your already glowing complexion, use your fingers to apply a thin layer of NARS Pure Radiant Tinted Moisturizer. Conceal any blemishes and underage dark circles with NARS Creamy Radiant Concealer, gently tapping with your fourth finger. I also blend a small amount of concealer on the upper eye lid to provide a smooth base for eyeshadow, or just to provide a flawless appearance. When you are happy with your blending, use a fluffy brush to dust a sheer translucent powder, like NARS Pressed Powder, over the entire face. This will set your make up base. Keep the pressed powder with you throughout the night for touch ups. 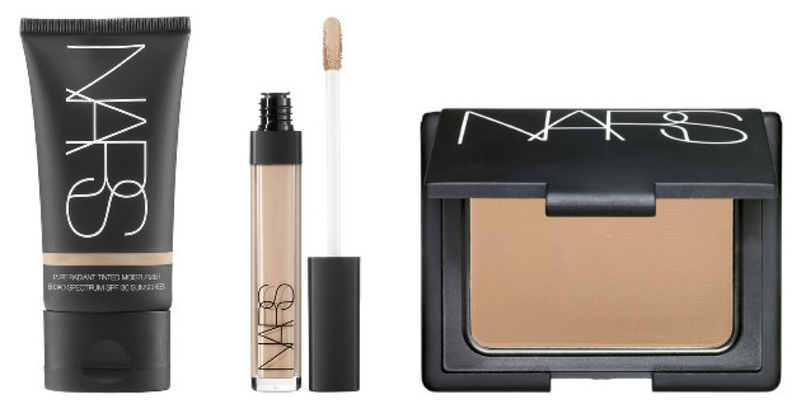 Three steps to a perfect complexion: NARS Pure Radiant Tinted Moisturizer for sheer coverage, NARS Radiant Creamy Concealer, and NARS Pressed Powder. Once your skin and base is complete, the rest of the look is easy. Choose either your eyes, your lips, or your cheeks to emphasize, unless you are going monochromatic for the “No Make Up” trend. Among the Red Carpet trendsetters, there are subtle differences between each of the women. Jennifer Aniston has perfected the California-Surfer-Greek-Goddess look like no one else. Growing up Greek, myself, she has been a pinnacle of beauty and elegance that I used to shape my own look. To replicate subtle healthy glow, use to products with a bronze hue keeping the skin matte, lips glossy, and eyes bold. Use a matte bronzer, like NARS Bronzing Powder, and apply highlighter under the brow bone and above cheeks for a glowing look. Use a subtle brown gloss with some shimmer, like Laura Mercier Lip Glace in Bare Beige, and load lashes with a curling mascara like Dior Overcurl. Reese has perfected the “No Make Up” trend, with the only noticeable colour being on the eyes. The subtle orange-brown showcases her blue eyes, and her muted creamy pink lipstick is meant to look like she is not wearing anything. Using a peachy brown eye shadow hue like MAC Eye Shadow in Texture, sweep the colour onto the upper lid and lightly as a liner on the lower lid. Her cheeks are dusted with an ultra-sheer wash of colour, like Clinique Blushing Blush in Aglow, and the lips have just enough colour and sheen to look healthy. Try Bite Beauty Luminous Creme Lipstick in Salut. Jennifer Lopez’s make up is all about big lashes and a luscious, healthy looking Barbie-pink smile. To get the look, prep the eye by applying a thin line of dark eyeliner like Lancome Le Crayon Eye Kohl in Black Coffee to help false lashes blend in. Next, glue your band of false lashes as close to the lash base as possible. For a dramatic look, choose a dense set like 156 Genevieve by Make Up For Ever. Complete the look with a light pink lipstick with a blue undertone like Buxom Full Bodied Lipstick in Mistress. For going out, Margot Robbie’s look is a personal favourite of mine, and is incredibly easy to pull off. Start with defining your brows with a matte shadow and lightly pulling the colour through the hairs with an angled brush. Lancome Color Design Eyeshadow in Vintage works well for my dark chestnut brows. Load upper lashes up with a black volumizing mascara like Dior Diorshow, and lower lashes with MAC Extended Play. Finish the look with a matte, orangey-poppy red lipstick, like my personal favourite NARS Heat Wave. When applied with a light touch, luminizers can be your best friend and will take your look to new heights. For Lupita’s dewy skin, mix a little bit of luminizer into your foundation or tinted moisturizer (before applying your setting powder). Her make up artist has used it all over, but you can also control the product and just apply under the brow bone, above the cheeks, the bridge of the nose, and lightly on the chin. Try BECCA Shimmering Skin Perfector in Opal. Next, create a smokey eye look with a cool icy shade like Make Up For Ever Eye Shadow in ME 116 Silver. Polish your pout with a beautiful glossy and glitter bronze like Buxom Full On Lip Polish in Ava. Jenna Dewan’s look is all about lush, soft, mink lashes. Similar to Jennifer Lopez’s lash-ious look, apply a thin line of black eye liner to the upper lash line so the lashes blend seamlessly. Try the Too Faced 3-Way Lash Lining Tool to wiggle colour as close to the lash roots as possible. Apply a band of dense lashes like Make Up Forever Lash Band 30 Zoe. Finish the look with an electric orange-red lip stick like MAC Lipstick in Lady Danger. By following my easy make up and skin care tips, you can replicate your very own red carpet beauty look at home. The most important thing with make up is to have fun! If you do not like the look, just wash it off and start again.